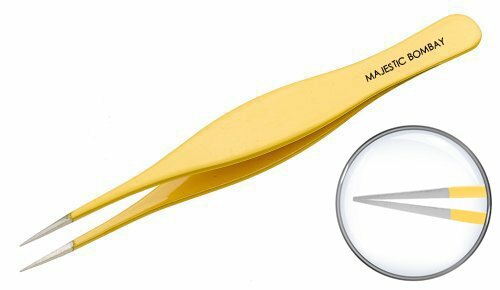 I just got these great tweezers from Majestic Bombay and I use them all the time. This is a really nice set of tweezers and they work really well. It comes in a plastic case you can store them in and keeps the well protected and clean. The ends are really pointy so you can really get the item you are trying to remove and get a great grip. They work really well for splinters or in grown hairs. They come with a plastic cover for the tips as well. Very high quality and works really well. PERFECT FOR SPLINTERS – Are you a magnet for splinters? Do you encounter splinters, debris, thorns, glass, metal, and other things embedded in fingers, hands, feet and legs? These stainless steel tweezers are perfectly aligned, hand filed calibrated and sharp tips that close evenly for smooth maneuvering around almost invisible splinters! INGROWN HAIRS AND EYEBROW HAIR- They are not just good for those troubled ingrown hair, but also for precision eyebrow plucking. They pick up smallest individual hair that standard tweezers would not be able to get to. FIRST AID-Important tool to have in any first aid kit. Keep one in your medicine cabinet and one for your toolbox.